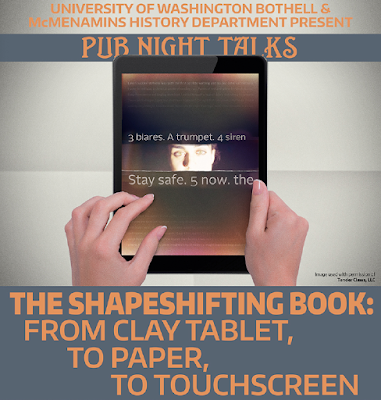 Amaranth Borsuk, assistant professor, School of Interdisciplinary Arts and Sciences, University of Washington Bothell will present the Pub Night Talk on Tuesday, November 27, 2018 from 7-8:30pm (doors open 6pm) at Haynes’ Hall, McMenamins Anderson School, 18607 Bothell Way NE, Bothell. “The Shapeshifting Book: From Clay Tablet, to Paper, to Touch Screen,” a Pub Night Talk cosponsored by the University of Washington Bothell and McMenamins. The book has taken many shapes over the thousands of years people have recorded information. Borsuk explains how it has always been a dynamic, interactive experience and imagines what the book might become. Free and open to the public. All ages welcome. Seating: first come, first served. Talk followed by Q/A.